All three Germans in the office have started baking their own bread. The one above is mine from this past weekend. It has bacon in it. It’s so good even the camera couldn’t focus on anything after it was cool enough to eat. 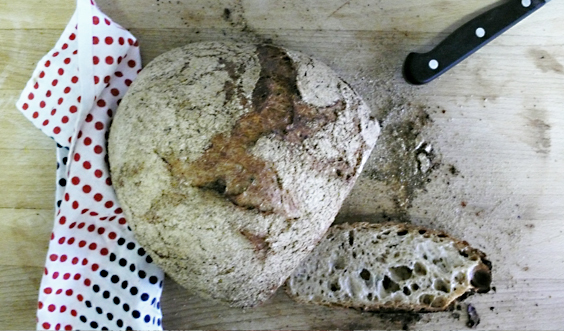 We got started just after the winter holidays with Jim Lahey’s book The Revolutionary No-Work, No-Knead Method. In a nutshell, you mix the ingredients the day before you plan to bake. Water, flour, yeast and salt ferment for 18 hours and produce a sticky dough that you shape and let rise again. You bake the loaf in a cast iron pot and out comes a crust that is so crackling good that it reminds me of home. It’s kind of hard to convey how exciting it is without letting you take a bite. We shared one of the first loaves with some favorite clients when they came in for a meeting. I’m pretty sure that’s why the project is going so well. Here’s the original recipe from the Sullivan Street Bakery. Ack. That looks DELICIOUS. I have been itching to try that recipe myself, and that addition of bacon. Pure genius. Where are Olaf and Marco’s bread? ?